The Compulsive Reader: Interview with Anna Carey! Back in September, I counted down to the release of Eve with Anna Carey, and now she's back on the blog with another interview! 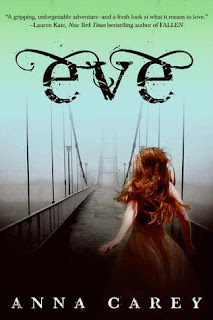 If you haven't already read Eve, I encourage you to do so, and if you haven't heard of the book, please check out my review! TCR: What's the best reader reaction to Eve that you have received thus far? TCR: If you were stranded in the wilderness like Eve is at one point in the book, what would be your survival strategy? TCR: What are some of your writing essentials? AC: I need my youthberry tea from Teavana (if it actually works I've shaved ten years off my age), a couple of Dum Dum pops, and Freedom, which has changed my life. The program is cheap ($10) and allows you to block the internet on your computer for up to eight hours at a time. You know you're living in "the future" when you have to pay your computer to withhold things from you. TCR: Can you share any information with readers about Eve being developed into a TV show? AC: It's in the early stages, but the series has been optioned and a pilot is in development. I'll keep everyone updated on facebook and twitter! TCR: I can wait to hear more! Thank you so much, Anna! If you want to read Eve, then fill out thr form below for the chance to win a signed copy! You can also visit the official Eve website, Like it on Facebook, follow Anna Carey on Twitter, and read her blog! Yay! Wow, she seems like a fantastic person. I have not read Eve but it is definitely going on my TBR list. I think I am going to nominate her for an interview on The Book Report, a radio show I started listening to recently. 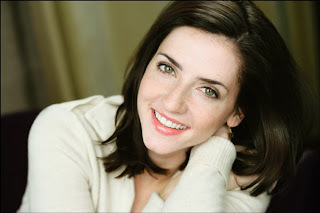 It is such a fun show, I would love to hear Anna talk about her writing on it. Go to http://bookreportradio.com if you are interested, they have the schedule and station list on there. looked for her interview there and then re-read your comment Brooke and realized you were going to nominate her! I think shed be great for that show! I only listened to one ( with a fabulous interview with Alice Hoffman of the DoveKeeper) but it was fantastic. Thanks for the find!